Curious Coloured Translucent Paper is a premium quality transparent paper able to enhance any creative communication as an alternative to conventional papers. Curious Translucents are suitable for tracing, technical design and creative design applications such as overlays, dividers for annual reports, catalogues or brochures, invitations, cards, business cards and more. The possibilities are endless. 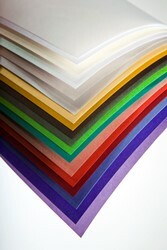 This range of coloured translucent paper is available in a wide selection of colours, weights and sizes. It offers a smoother, less brittle paper that’s less prone to cracking compared to budget tracing papers. Colours available include bright white, flame red, blue, gold, ivory, pearl and more. Curious coloured translucent papers are high performing with standard and specialised printing techniques and although it is not guaranteed for use on laser or inkjet printers, acceptable results can be obtained.